On December 7, 2016, the IGC co-hosted an informal roundtable discussion on South Sudan with the House of Lords in London. Participants attending the roundtable discussion (Peter Ajak Biar, IGC Country Co-Director in South Sudan, and Lord Donald Curry among others) briefly discussed the current situation in the country, and brainstormed possible short-term and long-term measures that could be undertaken to achieve greater political and economic stability in South Sudan, and the possible contribution that the international community could make in this regard. Violence that initially broke out in Juba in December 2013 has since spread beyond the capital, notably to Equatoria, where militia groups are active in Yei, Yambio and elsewhere. The conflict has taken on an ethnic undertone, characterized by hate speech and frequent ethnic killings. Interaction between tribes is reportedly largely limited to incidents of violence. 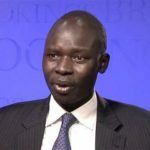 In November, Adama Dieng, the UN special adviser on the prevention of genocide, warned that the violence in South Sudan has the potential to escalate into genocide. Atrocities in the country are horrific and widespread. Despite government assurances to the contrary, it’s now generally agreed that the peace agreement has failed. The importance of the role of churches and women’s groups in South Sudan was recognized, and there was consensus that the country would benefit from these institutions being given greater scope to influence events in South Sudan, such as the peace process. It was also agreed that there is a crucial need to establish a process that can facilitate a national dialogue, bringing together different tribes to develop a shared vision of South Sudan. To this end, in Nairobi in January 2017, the IGC will host a forum for young South Sudanese leaders to initiate the process of developing a national dialogue that is inclusive of all tribes and which shall address the current and future challenges of South Sudan.